Health-Promoting Lipids from Purslane (Portulaca oleracea L.): Isolation, Characterization, Quantification and In Vivo Assay of Angiogenic Activity. Jeella Z. Acedo, Charisse T. Reyes, Evelyn B. Rodriguez. Philippine Agricultural Scientist 95 (4): 362–369, December 2012. Purslane, a common Philippine weed, has served as human food in some countries. In this study, the health-promoting lipids namely phytosterols, α-tocopherol, and squalene were isolated from local purslane and characterized using chemical tests and ultraviolet and Fourier transform infrared spectroscopy. Purslane (100 g fresh weight) contained 6.52 ± 0.44 mg phytosterols, 9.05 ± 0.04 mg α-tocopherol, and 115.0 ± 2.0 µg squalene. Furthermore, its oil contained omega-3 fatty acids α-linolenic acid (17.00 ± 0.33%) and docosahexaenoic acid (5.08 ± 0.49%). A new semi-quantitative in vivo duck embryo chorioallantoic membrane assay for angiogenesis was also described in this study. Angiogenesis refers to the growth of new blood vessels, which is implicated in diseases whenever insufficient or excessive. For instance, coronary heart disease can be caused by insufficient angiogenesis due to the massive tissue death, while cancer can be induced by excessive angiogenesis. Purslane oil and its saponifiable and unsaponifiable fractions exhibited anti-angiogenic activity which can be attributed to the presence of the aforementioned health-promoting lipids. These results signify the nutraceutical potential of purslane and its possible use in modulating angiogenesis thereby reducing the risk of several diseases. 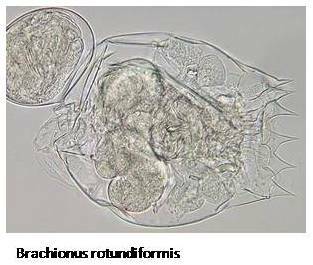 Cellulolytic activity of tropical marine rotifer (Brachionus rotundiformis). ELBA Bioflux, 5 (1): 21-27, June 2013. This study is the first to characterize the cellulose degrading enzyme in the marine rotifer, Brachionus rotundiformis. The cellulose degrading enzyme has large market potential especially for bioethanol production. The activity of this cellulose degrading enzyme was assessed thru various pH levels, temperature ranges and substrate concentrations using carboxymethyl cellulose (CMC). The result showed that the maximum catalytic activity was at pH 5.0, is effective in acid digestion within the range of intestinal pH of the rotifer and the optimum temperature for substrate hydrolysis is 30.0°C which is in the temperature range (28.0-35.0 °C) of the rearing medium for the organism while substrate concentration – activity plot revealed a concentration of 2.5 mg CMC/mL at which half the active sites are filled and a maximum velocity of 178.6 µg glucose mg protein-1 hr -1 . In vitro hydrolysis of pure cellulose (filter paper) established that the crude enzyme has cellulolytic activity. The Complexity of Inferring a Minimally Resolved Phylogenetic Supertree. Society for Industrial and Applied Mathematics – Journal on Computing, 41 (1): 272-291, February 2012. One of the common criticisms of supertrees is that they may suggest evolutionary relationships among leaves that are not directly supported by any one of the input trees, which can create false groupings in the form of “spurious novel clades”. Therefore, it is reasonable to try to avoid making more such statements about the evolutionary history than necessary to obtain a supertree, and thus to introduce as little unsupported branching information as possible. For this reason, minimally resolved supertrees, i.e., trees that contain as few internal nodes as possible while still being consistent with all of the input, are important in Bioinformatics. Furthermore, a minimally resolved supertree gives a simpler overview of the observed data than a supertree containing many internal nodes, which in itself is a desirable property as it makes it easier for researchers to represent relationships among nodes and to organize the data. However, the computational aspects of inferring minimally resolved supertrees have been overlooked until now.